Located next to King's Chapel on Tremont Street, King's Chapel Burying Ground was Boston Proper's only burying place for nearly 30 years. Older than the Granary Burying Ground, in fact, as old as Boston itself, King’s Chapel Burying Ground boasts such illustrious residents as John Winthrop, Massachusetts’ first Governor and Mary Chilton, the first woman to step off the Mayflower. Most notable is Joseph Tapping’ s stone in the front of the burying ground where a skeleton and Father Time battle over the eventuality of death. It is Boston’s most beautiful headstone! According to custom, the first interment in King’s Chapel burying ground was that of the land’s original owner, Isaac Johnson. 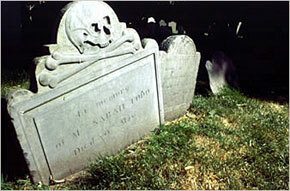 William Dawes, the “other” rider who dispatched to Lexington and Concord with Paul Revere is also buried here. King's Chapel Burying Ground is located on the Freedom Trail.